I taught the 2nd half of my elastic waist pants class last night at Joann’s Fabric. It was fun but somehow really nerve wracking. Every time I turned my around someone was pinning their pant legs together or sewing on a machine making a horrible racket. But at the end of the 2nd 3 hour class, all 6 students had pants! 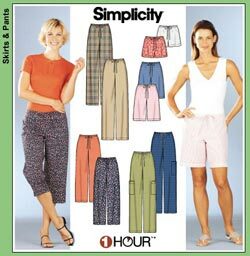 Yes, 2 three hour classes would make those pants SIX HOUR PANTS. The first one done was actually five and 1/2 hour pants. Now, I did teach the sewing novices how to thread a bobbin and preached the benefits of a little locking stitch at the end of the seam. But really! How can they really go around selling that thing as one hour??? The best part of the class was seeing a Viking sewing machine rep struggle and swear when she taught us all how to do a button hole on the store machines. Only 2 of the 6 tried to do a button hole (making drawstring pants, not elastic) and those two made the most beautiful buttonholes I have ever seen. There may be hope for me yet. So far in all of my 29 years I have only made hideous lumpy buttonholes and only when snaps were not an option.